Designer, Stylist and Planner, One Day Your Way is the collaboration between creative soul Angela Fragiacomo and styling guru Katie Fleisner. A down-to-earth team of two, they love to create unique, elegant and beautiful occasions for the couples they work with. With a strong focus on design and all things beautiful, they love to push the boundaries and create bespoke pieces that enhance the venues and spaces they work with. K & A: We are Katie & Ange and we are both the directors of One Day Your Way. We established One Day Your Way over 5 years ago with the commitment of thorough planning, beautiful and seamlessly executed styling and an experience that is unique and true to all of our couples. 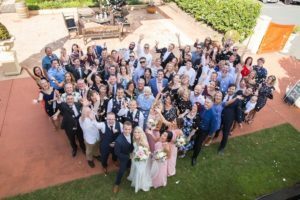 Ange has over 15 years experience in the event industry and knew that it was time to utilise that experience and to fulfil a dream of owning her own events business. I had a real passion for events and styling, i have a background in sales management & planning and combined we knew we had the foundation, drive and skills to build One Day Your Way into a successful business. We spent 9 months researching, leaning, discussing and developing what type of business we wanted, and the experience we wanted couples to have when they worked with us. Weddings are such a happy and beautiful occasion and we are so lucky to be a part of this amazing industry. We always go above and beyond for our clients, we ensure every event is unique, is always developed from our clients likes and their desire for the experience they want to have as well as their guests at their wedding or event, and we ensure we execute every element to perfection. There is no exact formulas that work for events, each client is different, has different priorities, wants, needs both personal and for their guests which is so much fun when developing and executing the final concept. Modern Wedding: How did you get started as stylists? K & A: Ange always knew at some point she wanted to start her own company. She had the event management skills amongst others, but didn’t tick all of the boxes she needed to cover all aspects of the business. She approached me to see if I was interested and we sat down, developed her ideas, and bought One Day Your Way to life. Research, learning and creating was the way to achieving our dreams and also having clients that trusted us to bring to life their visions. Talking with successful people within the industry and listening to their advice, watching them grow, and constantly staying on top of looks, ideas and being creative are what keeps us going. Our business thrives on pulling off different and unique pieces, looks and ideas. There are so many beautiful looks out there and every bride & groom has their inspiration, we always ensure we walk through their vision but we compliment it with creative twists and elements to ensure it is unique and beautiful and shows off them as a couple. K & A: We are loving the fresh looks of the whites and greens working in the elements of the metallic’s of Gold and Rose gold, you always win with this combo. On the other scale the greens with whites through to soft blush tones through to a deeper burgundy give off an amazing classic look. Modern Wedding: What are your favourite new styling trends for 2017/2018? Moody Vibes – We are moving away from the softer pastel colour palette to the deeper, sexier tones of colour in flowers, bridesmaids dresses, linens, even glassware and crockery. The use of Greenery is huge amongst this and then the deep pops of colours come through set a moody tone throughout the wedding. Metallics – no matter what the theme metallic tones can be entwined throughout the styling experience. Gold beaded charger plates and gold rimmed glasses will enhance your elegant affair, copper lanterns are the perfect touch to any lounge or outdoor reception, and garlands with a touch of metallic form the perfect backdrop for your selfie station. Velvet – Velvet is making a comeback and it has got us excited! From the table linens and runners to the gorgeous chairs, lounges, fabric ties on bouquets, it is beautiful, such a statement and the colour tones are amazing. Fabrics – we love building tables up from the linens through to the place settings and then the centrepieces. We love fulfilling the sense of touch, starting from the table linen and napkins, and we always feel adding a change in the linen can change a room so quickly. Furniture – We love working with different furniture pieces in each event, from the chairs to the different lounges, and tables, and bars.. Suppliers are always updating their pieces, and it excites us each time as just changing the chairs within a venue can open up so much creative design it is crazy. Flowers – As we now have an amazing inhouse florist here at One Day Your Way, we are so excited to push the boundaries and create amazing pieces with flowers as there are so many beauties out there we can’t wait to showcase what we have instore this summer working with flowers. Installations – Right now with almost every wedding we work on the Bride & Groom would love to have some hanging element in the room from the roof whether it be a beautiful floral piece or a unique design of lighting and floral, they would all really love to have something beautiful hanging above them or around the room with lighting incorporated– a beautiful statement piece. Candles – You can never have enough candles! We love working with this element, as they are beautiful, can smell amazing and turn any wedding into a warm, elegant affair. There are so many different types of candles, tea lights, pillar candles, taper candles, the lists go on and we are forever searching and researching different types, colours and ways to utilise them in weddings. The LED candles these days are amazing also, so even if your venue to limited to only using LEDs, they are still beautiful and can work just as well as the real ones when styled right! Modern Wedding: What are your top 3 tips for brides wanting to create unique wedding style? K & A: Unique to us means ensuring each element designed on your wedding day reflects the people you are, the love you have for each other, and the journey you have taken and will begin to take as husband & wife. Think about what you love to do as a couple – whether it is going to the movies, to see shows, going to the beach, or going to different restaurants and being a big foodie.. Just working out what it is you love to do as a couple can create unique moments at the wedding, from the food you have, to the cake you decide on, the place cards, there are so many different ways to incorporate what you love to do as a couple somehow in a different way into your wedding.. This is sometimes the way trends are made! Think about who you are as individuals - What is it you love to do and have grown up doing or have as a hobby. Are you a photographer, or do you love going out with friends to bar, dancing. Singing, painting.... Thinking about these elements can create little sections at your wedding such as a bar, or cocktails, or show guests your photography/painting in different ways such as their place cards, or table numbers. Show the guests elements about you that they may not know or would love to see and be as creative as you like with them. Think about the experience and the sensors of the guests you want to delight - What is it you want guests to say and describe the next day about your wedding? It was amazing, fun and the best wedding they have every been too and think about why they may say this? Was it the entertainment, the band and music, the dance you did, the Amazing centrepieces and tables, there are so many different ideas out there or that you can come up with. That is the great thing about weddings these days you can be as traditional or as non-traditional as you like. K & A: Both Ange and I were married (Ange) 7 and (Me) 6 years ago, trends come and go, and we have always said and been asked is there anything you would change about your wedding day... We have always answered No, they were perfect for us and what we wanted on our special days. They were unique in different ways and reflected ourselves and our husbands at the time.